led all scorers with 12 points. 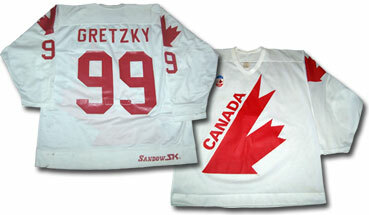 Jersey worn by Mario Lemieux during the 1987 Canada Cup. scoring behind Wayne Gretzky with 18 points. 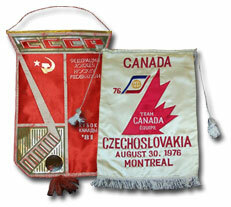 Mini-banner given to opposing players participating in the 1981 Canada Cup by members of Team Soviet Union. 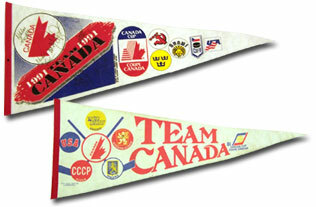 Mini-banner given to opposing players participating in the 1976 Canada Cup by members of Team Canada. 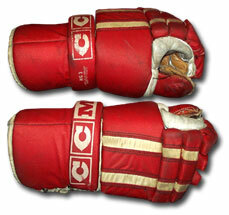 Gloves worn by Team Canada forward Danny Gare during the inaugural Canada Cup in 1976. 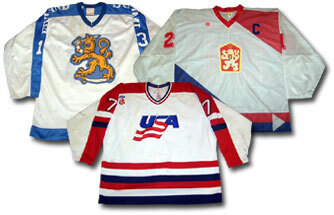 Jerseys worn by Veli-Pekka Ketola of Team Finland during the 1981 Canada Cup, Dusan Pasek of Team Czechoslovakia during the 1984 Canada Cup and Joe Mullen of Team USA during the 1991 Canada Cup. Jiri Bubla during the 1976 Canada Cup.